Emergency calls for burglaries in San Jose come in about 100 times per week and roughly 5,000 times per year. Burglary has increased nearly 50 percent in the past decade, according to records kept by the San Jose Police Department. The combination of more calls for service and fewer officers on the streets can mean residents have to wait a lot longer than anticipated for police to respond. Burglars broke into Chris Hennessy’s south San Jose residence in February. He dropped off his daughter at preschool and came home to find a brick thrown through his kitchen window. His television, computer and some hard drives were all gone. “My heart sunk all the way down to my belly and it was just a tremendous shock,” Hennessy said. He called 911, thinking the perpetrators may have still been on his property. “After that, it was at least an hour until police arrived,” he said. With burglaries up in San Jose over the last ten years, the NBC Bay Area Investigative Unit wanted to know if other residents had to wait that long for officers to respond to their emergency calls. Is Hennessy’s story unique or testimony of a growing problem? In response to a request to review their records, the San Jose Police Department confirmed that it does not track burglary calls. The police department’s public records office reported that producing the information would require a computer programmer, weeks of time and a cost of more than $10,000. Pierluigi Oliverio: “I think the public should be disappointed." 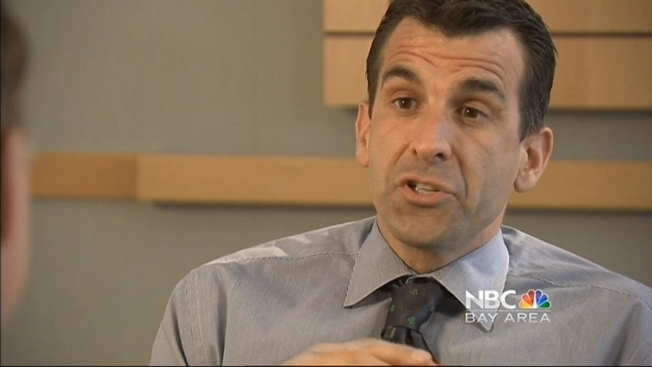 Sam Liccardo: “There’s no question we can do better....No one should be satisfied until the information is made public." Not only could SJPD not provide data regarding its average response time to all burglary calls, it also failed to produce the exact response time to just one burglary call—the 911 call made by Hennessy. Deputy Chief Dave Hober said the call took more than an hour because responding officers were dispatched to a high priority call after Hennessy’s call came in. “Would we like to have a quicker call time than that? Yes,” Hober said. He said burglaries are “absolutely a priority” but pointed to staffing and budget issues in explaining his department’s inability to quickly and efficiently provide burglary response time records for public review. “I think there are significant challenges but I think we are doing everything we can in an attempt to deal with the burglary issues,” Hober said. Hennessy says the police department failed to meet his expectations the February morning he got robbed. “Is it going to take someone getting killed before we have the police coming out sooner for a burglary?” Hennessy said. UPDATE - April 18, 2014: SJPD produced the exact response time to Hennessy's burglary, 17 hours after the investigation aired, and nine days after the request for the information was initially made. The records indicate that responding officers were rerouted to a higher priority call and arrived at Hennessy's residence in 52 minutes.